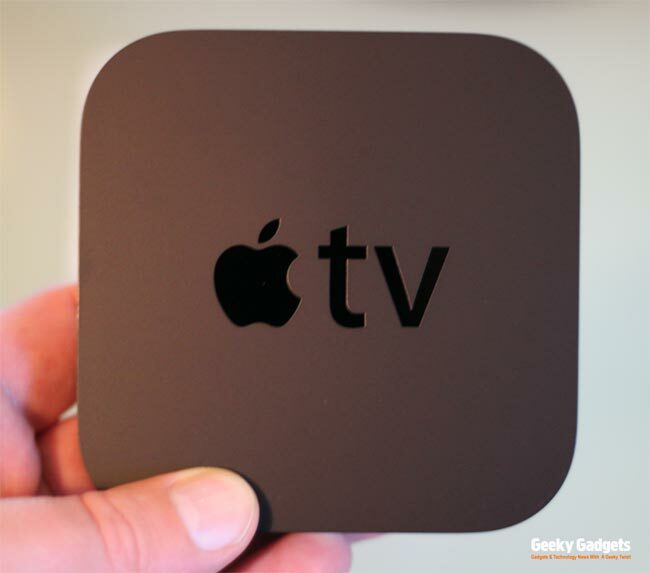 The second generation Apple TV has just been released and we have managed to get our hands on one. 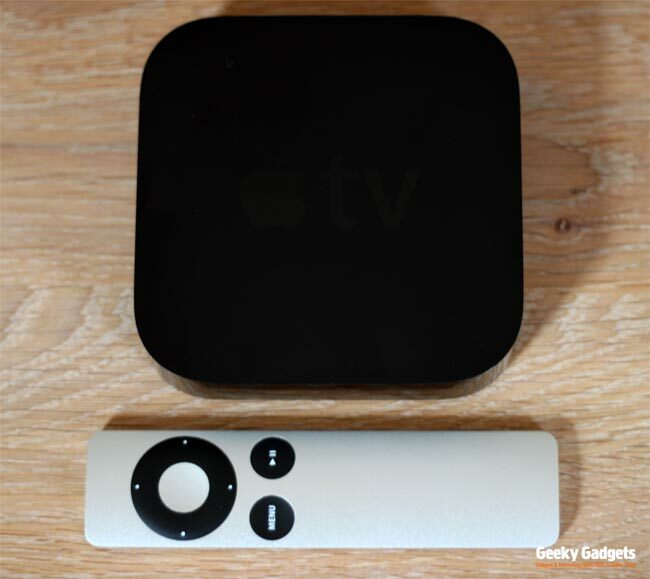 The new Apple TV is much cheaper than the previous version, priced at $99 in the US and £99 here in the UK. Apple have given the Apple TV a complete makeover from the previous version, it has been totally stripped down and is much smaller than the first generation Apple TV. The new Apple TV is tiny when compared to the previous version, it measures 3.9 inches by 3.9 inches and is just 0.9 inches thick, it is also much lighter weighing in at 0.6 pounds. 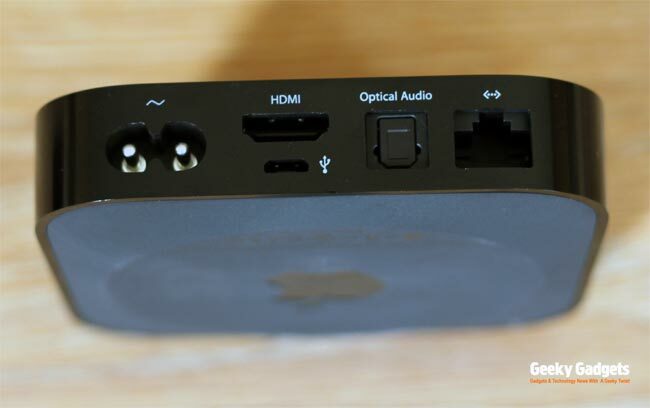 On the back of the Apple TV there is a power connection, HDMI out, a micro USB port and Ethernet, there is also built in WiFi so you can stream your content wirelessly from iTunes. The hardware inside the Apple TV is completely different to the previous model, it is now powered by the same custom A4 processor that can be found in the iPhone 4 and iPad. There is also 8GB of storage built in, but this is something that Apple doesn’t advertise and cant be used to store anything on, well at least for the moment, it also features 256MB or RAM. You can see the remote that comes with the Apple TV in the photo above, you can also use Apple’s remote app on the iPhone and iPod Touch, to control the Apple TV. 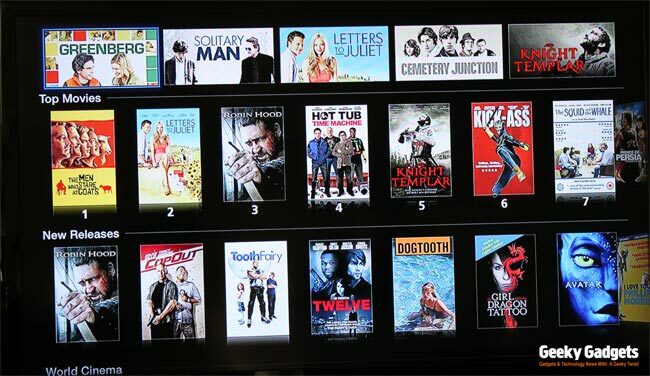 The Apple TV is very easy to setup, just plug it in, input your iTunes account details and you are ready to watch HD and SD movie rentals direct from iTunes, the movies are streamed directly to the Apple TV from iTunes over the Internet. 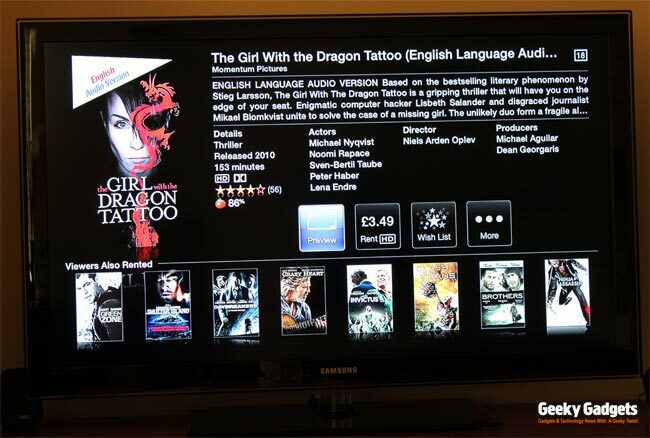 In the US you are also able to rent TV episodes, this is something that wasn’t available to us when we tested the Apple TV as we are located in the UK. SD content looks good, but HD content looks even better, it does look amazing on the Apple TV in terms of both streaming movie rentals from iTunes and also streaming content from your computer. 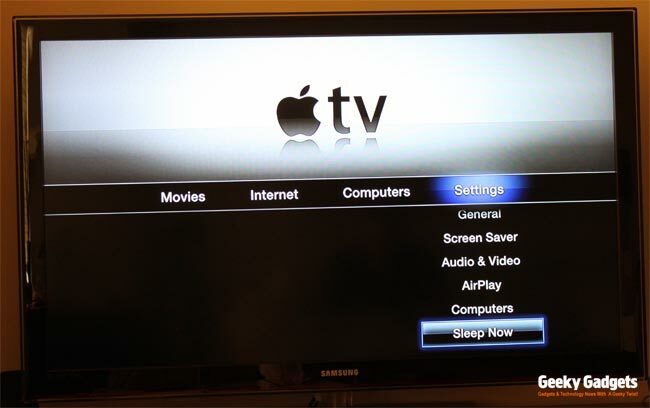 Setting up the Apple TV to stream content from iTunes is very easy, all you have to do is make sure you have home sharing enabled, and you can instantly stream music, movies and photos to your Apple TV. I tested this by streaming content from my MacBook over WiFi to the Apple TV, and it works perfectly, I tested both SD and HD movies that I had purchased from iTunes and they both streamed to the Apple TV from my Mac and it looked great. 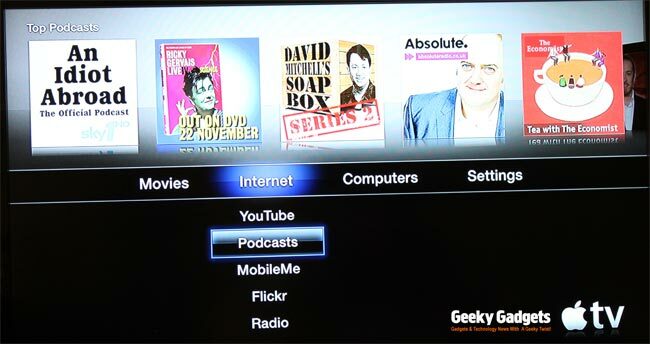 Other features on the Apple TV include being able to watch YouTube videos, listen to pod casts and Internet radio stations, these features work well, and HD videos from YouTube also looked great. One feature that will be coming to Apple TV in the future is called AirPlay, AirPlay will let you stream content to your Apple TV form any iOS device, like the iPhone, iPad and iPod Touch. This will be a great feature as you will be able to continue watching a movie on your Apple TV, that you have previously been watching on your iPhone or iPad. The Apple TV is a step in the right direction for Apple, being able to stream content from iTunes to your HDTV is great, and although this is nothing new, the new Apple TV is much more affordable than the previous version. There are a number of things that we would like to see on the Apple TV in the future, and we are hoping that Apple will continue to develop the Apple TV OS, which is in fact iOS to enable new features. I would like to see the ability in the future to add additional storage to the Apple TV, this is something that Apple probably wont do, although you never know. I would also like to see apps on the Apple TV, this is something that we suspect Apple is working on, we cant think of any other reason why they would have built it in iOS, other than so that they can sell us Apple TV apps in the future. 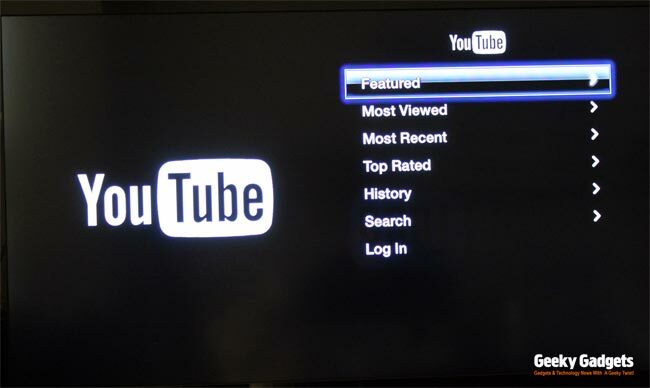 Another thing I would like to see on it is a web browser, the new Google TV which is due out this week comes with this out of the box, and this is something that we hope Apple will add in the not to distant future. Overall for the money, the new Apple TV is good, it does need some work in a few areas, mainly content as here in the UK as opposed to the US the only thing you can rent on it is movies, whilst the US version has support for Netflix and also has support for TV rentals. If you are looking for a device to play content from your iTunes library on your HDTV, and also use to rent movies and TV shows from iTunes, then the Apple TV is definitely worth checking out, and the new much lower price point will appeal to many people as it is a much cheaper option than a fully fledged HTPC.